It was a clear cool morning in South Florida, just West of Lake Okeechobee. The moon shed little light in the sky which provided our hunting group a beautiful view of the stars and their constellations. Almost an omen, Orion, the celestial hunter, shined brilliantly up above. We quickly climbed up into the Chappy’s Outfitters swamp buggy. The chilly 43 degree weather was much more apparent. My face paint provided very little protection to the sharp cold air as we zoomed through the congested tropical terrain of the Florida Everglades. I was the last to be dropped off. It was dark and extremely quiet. Not even the birds were awake. I quietly climbed into my blind and waited patiently for the sun to rise. Shortly after getting settled in my perch, the warm glow of the sun started to make its way through the trees. The wind was calm and the woods started to awaken. I was sitting on the outer loop of a large open field. The field was surrounded by saw palmettos, large oak trees and various types of palm trees. It was too dense to see through. There was a feeder on the field roughly 120 yards to the left of my location. A low lying area with a pond was directly in front of me and the field stretched another 250 yards to my right. Two hawks kept me company for some time. They were perched on branches sticking out of the pond, patiently scanning the field for their next meal. An hour later they left their perch to find a better opportunity. That was my signal to do the same. I quietly attached my custom built 300 Blackout chambered SBR to my single point sling and made my way down the buggy trail. There was no movement in the field to my left and the thick vegetation to my right blocked my view. I continued forward another 50 yards, muzzle down in patrol ready position. The path circled right into the same area I had previously been unable to see through. The path was only 8 to 9 feet wide and it looked like it had not been traveled in some time. The palms and oaks on both sides of the trail provided a natural canopy and the saw palmettos provided a natural barrier limiting my view and movement to only what can be seen in front or in back of me. Slowly, I walked forward hearing something moving in the saw palmettos to my left. I quickly transitioned to low ready and spun my head toward the sound. Seconds later, a hog appeared out of the thick brush and bolted towards the trail entrance. I ran back towards the trail opening hoping to get a shot in the open field, but the hog was gone. Without hesitation, I turned back around walking slowly at low ready toward where I’d previously heard the hog. I’d walked back in no more than 25 yards when I again heard something moving to my left. I immediately raised my rifle to eye level as I walked forward, transitioning from a low ready to a target engagement position. My cheek was firmly against the stock and my eyes focused through the red dot optic as I scanned the saw palmettos for movement. Suddenly, fifteen yards in front of me a black wild hog crashed through the saw palmettos to my left sprinting toward the right side of the narrow path. With only a fraction of a second to react I immediately identified the target and unleashed two consecutive shots of Remington 130 grain 300BLK Hog Hammer loaded with Barnes TSX bullets. Double Taps aren’t just for range days! The rounds slammed into the hog dropping it into the dirt with a thud! Amazingly, in such a short period of time, I’d placed a bullet just below its eye and just behind its ear. Either shot on its own would have provided a fatal blow. My success that clear and cool morning was greatly influenced by my tactical firearms training, choice of equipment and “ready” position decision making just prior to engagement. Training alone will not get the job done. You need the right equipment. I built my 300BLK SBR upper using a Daniel Defense 10.3” Cold Hammer Forged barrel which provides me the full benefit of supersonic or subsonic ammunition. My receiver, BCG, lower receiver and trigger are from Spikes Tactical. I chose the Spikes Single Stage Battle Trigger for hog hunting. The double tap that took down that hog was easier that it might have been otherwise. The reset is great and its trigger pull is between 5 and 6 pounds. It’s a great fit for my style of hunting. The most important tactical factor in my experience that day was the “ready” position. In the end, my tactical advantage was being “ready,” rifle up, cheek weld in place, scanning through my red dot sight. There was a wild hog in my immediate area and a low ready would have delayed my reaction. This encounter provided only half a second to react. 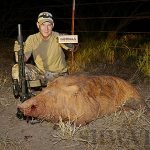 Had I not raised my rifle to eye level upon hearing the hog’s movement, the delay in target acquisition due to the transition from low would not have allowed me to get the shots off. Fortunately, foreseeing this issue, I was able to identify the target, choose the bullet placement and fire the rifle twice within the same time period. So yes, in the end, I was “Ready” for my close quarter hog hunting encounter. Get out and practice so you’ll be “ready” when you need to be. You might want to try out SHWAT’s “Three Little Pigs” drill as demonstrated on YouTube. Learn more about Erik here. There are lots of stories waiting to be told. Send us yours. If we use it, we’ll send you a nice “Thank you” package! This entry was posted in The Tactically Trained Hunter - Erik Alexander and tagged 300 Blackout, 300BLK, Florida, Hog Hunting by Erik Alexander. Bookmark the permalink.